The New Hope Cathedral, Inc., formerly New Hope Christian Ministries, is of non-denominational faith, believing in God the Father, God the Son and God the Holy Ghost (Spirit). The ministry has been flourishing since its establishment in July 2001. We believe in being a part of our community, meaning being a problem solver. Far too long the disease of diabetes has been a part of our community, first diagnosed in 1465. How many heard Grandmothers referring to somebody having sugar? The journey to a cure starts now. The mission for this generation is not to carry this another year. The purpose of the 5k Run/ Walk is to raise funds for critical research for a cure. We are counting on your love and support in raising funds for “Journey for a Cure starts NOW!! Diabetes Run/Walk” to help raise the much-needed funds to find a cure for diabetes and improve the lives of everyone impacted by diabetes. 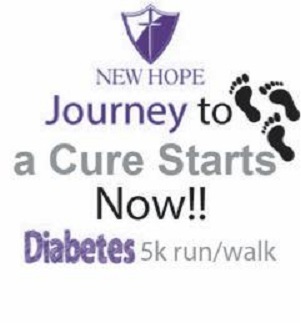 There are nearly 26 million American children and adults living with type 1 and type 2 diabetes, and your support will make a difference in their lives and ultimately Cure Diabetes. Registration and number pickup will take place inside the church. The course is an out and back route that starts and finishes across the street at the school. Come back to the church after you finish and stick around for the awards ceremony, while enjoying plenty of food, music and fun! Awards will be given to overall M/F winners and M/F in various age groups.